We hosted Dennis and Chip Reberstein this week. They gave a talk on grooming, stripping and rolling a coat and spent three very educational days at our kennel. We were so glad to have them here along with several of their dogs and puppies. The salt and pepper girl in these pictures is my retired Jazz girl. Looks like she is still going strong at age 8. 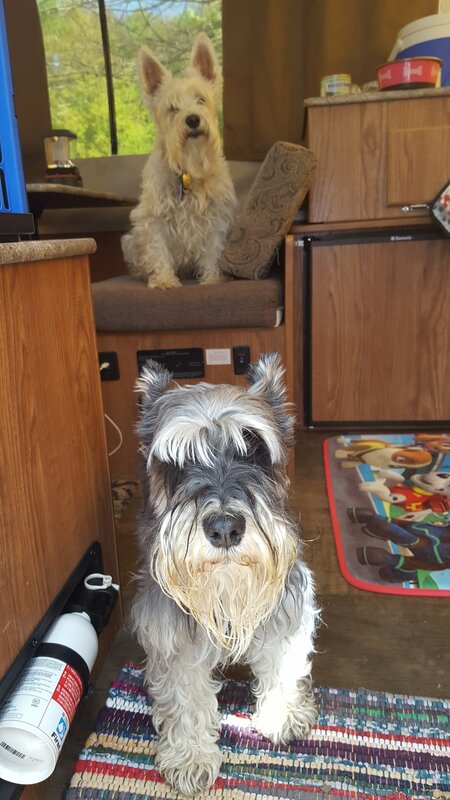 Her "mom" has decided to take them camping this year and it looks like they are going to be great company, keep her warm on those Pennsylvania nights and have lots of fun by the lake. It is always so nice to receive pictures from my retired girls and boys. Knowing they were placed in a good home is very important to me and seeing them live out their lives being loved and cared for is amazing. Thank you so much Linda!!! Give Jazz a kiss for me, I think about her sometimes. What's happening in March at Findell Kennels. We will be very busy with grooming and training. This year I will be doing some obedience training on Dottie and Rosie. I am hoping to put a CD on them. Artie will do his breeding and go out with a handler for his Championship. I'm getting older on my feet and I think this will work better, they just better be really sweet with my little guy and not allow him to get too serious or grow up too much because he is still playful and loving and I like him that way. At Findell Kennels, we will be repainting the inside of the schnauzer quarters and also re painting the floors. Doing this once a year keeps everything sterile and bacteria free. Crates will get a monthly scrub down and be nice and spring fresh and the area will be bombed for any spiders or flys that happen to have gotten in during the winter. Spring is on the way. We received our first package of fly predators yesterday. This is an amazing bug that eats fly larva. We have been using these things for almost ten years and hardly see a fly in the summer even though there are cows across the street. Wonderful way to use nature to reduce the fly population. January is a cold month here in Arkansas and Findell Kennels is keeping it warm with long walks on three acres, running through the snow where possible and digging up moles. These are the most fun things to do. January is also the time for all yearly shots. I still believe in giving yearly shots. There are a lot of people and breeders who are doing titers to check for the residuals of previous shots, however, I have not had problems with diseases and so why would I change something that works. It's winter and it's cold so we are doing a good cleaning of parasites in the yard, and in the body. After a trip to the vet to ensure no one has heartworm, we will be doing a good worming to get rid of any parasites that might be hiding out inside our babies. Although we worm monthly during the summer, during the winter we skip a few months and give the bodies a rest from chemicals.